If for your next getaway in Charente-Maritime, you fancy a bit of nature and some peaceful strolls with no cars in sight, we’ve found just the thing – a couple of pretty little islands with an undeniable wild charm, where cyclists and pedestrians set the pace. So get on your bike and visit Île Madame and Île d’Aix, in the heart of the Charente estuary. These two little islands, each with undeniable charm, will impress you with their calm, laid-back vibe. After a short 20-minute ferry crossing (departing from Fouras), you disembark onto a charming crescent-shaped island, Île d’Aix. You can meander through the beautiful, well-preserved countryside on foot (three hours is plenty to walk around the island), by bike or even horse-drawn carriage! A haven of green tourism. Here, we suggest some activities to help you get the most out of your visit. Hey presto, you’ve travelled back in time! While walking around the village’s little streets, you’ll quickly realise that time has stood still here. Relax and enjoy the tranquil setting as you stroll around. Admire the pretty little houses with their colourful shutters and hollyhocks so typical of this Charente-Maritime island. Culture lovers mustn’t forget to visit the Napoleon Museum and the African Museum. This little island might only be three kilometres long and 600 metres wide, but it still has a speciality – mother-of-pearl! Since the 1950s, family-run business La Maison de la Nacre has taken pride in helping visitors explore the work of mother-of-pearl craftspeople. When you stop by the boutique, don’t forget to pick up one of their delightful mother-of-pearl souvenirs! It’s time to go off and explore the rest of the island. 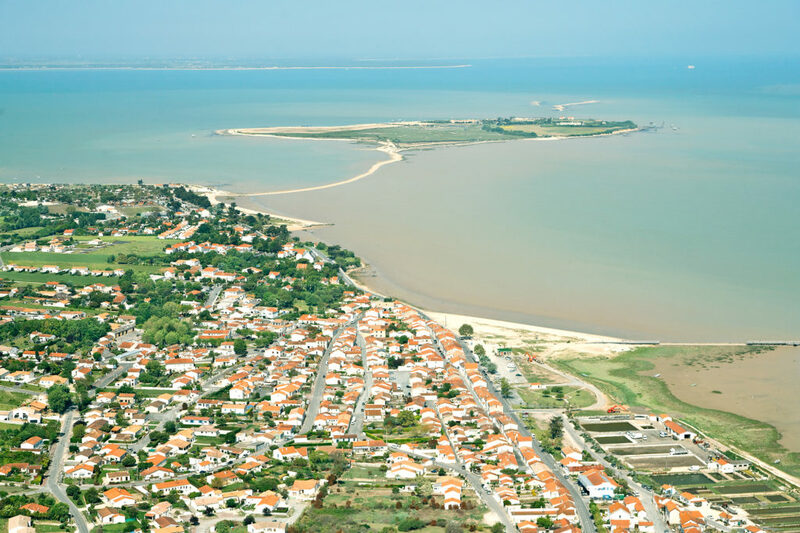 Nature and tranquillity are at the top of the list for this visit to Île d’Aix! Be transported on the bracing sea breeze to check out at the region’s flora, such as the hollyhock and the marshland flowers that spring up everywhere. You can walk around Île d’Aix in about three hours. On your way, have your camera at the ready to capture the island’s fantastic panoramic views: in the distance you’ll see Fort Boyard, Île d’Oléron and Île de Ré. And you can’t leave without a photo of the twin lighthouses, icons of the island, or no one will believe that you’ve visited Île d’Aix! For total relaxation under the sun, stop at one of the beautiful sandy beaches, such as Anse de la Croix or Grande Plage. You can either laze on the beach or paddle in the sea. Visitors seeking wild, well-preserved nature should go straight to the smallest of Charente Maritime’s islands, Île Madame, which is just 800m long and 600m wide. Interestingly, however, the island can only be accessed at low tide. You’ll travel along Passe-aux-Boeufs, a pretty 1km strip of sand and shingle that becomes impassable as the sea rises – pay attention to the tide times! Once you’re there, it’s very easy to get your bearings because this Charente-Maritime island has just one road all the way around. As soon as you arrive on the island, you’ll be enchanted by the welcoming sight of the colourful fishing huts. Just one word of advice for the day you visit Île Madame: don’t forget your camera! You’ll be blown away by the unique light that reflects off the sea in different ways throughout the day, the bright green of the samphire fields and the shape of the yellow, blue and green fishing huts. It’s such a pleasure to feel the salty sea air and hear the wind as you walk; circling the island will take you just two hours on foot. On the way, you’ll pass by the fort built in 1703 to defend against English attacks, little wild coves, a sandy beach to the south of the island and fantastic views of the Charente estuary. You’ll be able to catch a glimpse of Fouras-les-Bains, Île d’Aix, Île de Ré and Île d’Oléron, without forgetting the legendary Fort Boyard. The adventurous can have a go at sea fishing. Get your boots on and make the most of low tide, when all kinds of scallops, razor shell clams and cockles can be discovered. Catching your own evening meal is always a great moment to share with family or friends! Make sure you check the sea fishing regulations so that you help to preserve this beautiful natural environment. It’s impossible to miss the aquacultural farm – it’s one of the very few sites on Île Madame! For more than 30 years, this family farm has been producing oysters, clams, king prawns, salt and samphire. This plant is sometimes known as “sea pickle” and has a deliciously salty taste. So come and meet Jean Pierre and Elizabeth, who will be delighted to give you a guided tour of their farm. They’ll tell you about its history, their beloved Charente-Maritime island and their traditional production methods. And why not continue to admire the beauty of nature by enjoying a few oysters with a small glass of cold white wine while looking out to sea? After a day like that, can you be sure you’ll want to leave?